On Monday, the U.S. Department of Agriculture’s Economic Research Service (ERS) published an overview of the Conservation Title of the 2018 Farm Bill. Today’s update looks at a couple key points from the ERS summary. 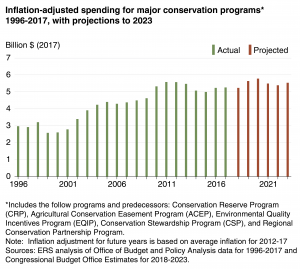 After highlighting several changes to specific programs in the Conservation Title, ERS turned to a broader focus on the economic implications of the new provisions. “Agriculture Improvement Act of 2018: Highlights and Implications. Conservation: Title II.” USDA’s Economic Research Service (https://goo.gl/hNh4Rx, February 11, 2019). 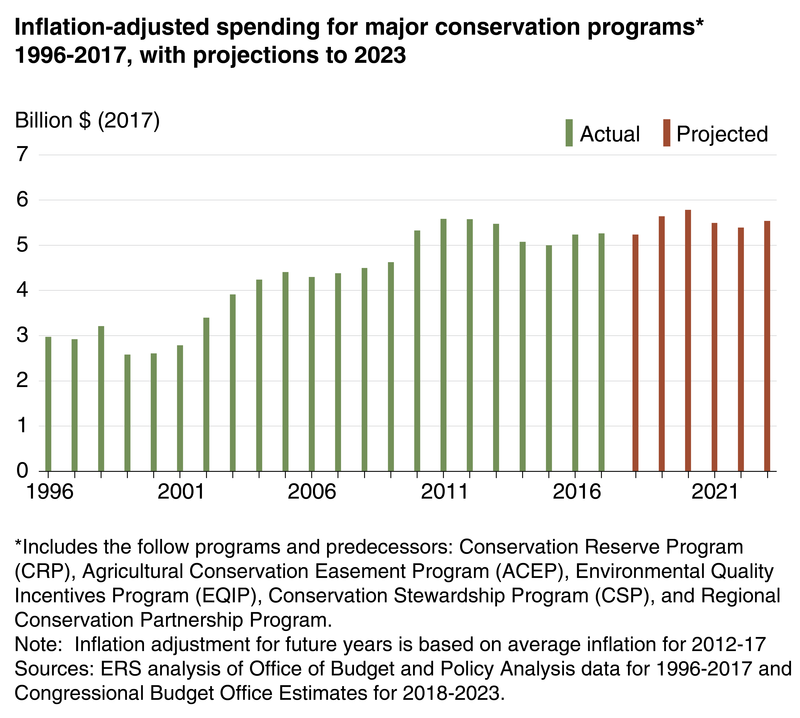 In addition, ERS stated that, “While overall conservation funding is roughly equal to baseline levels for FY2019-FY2023, the 2018 Act shifts funding among programs. 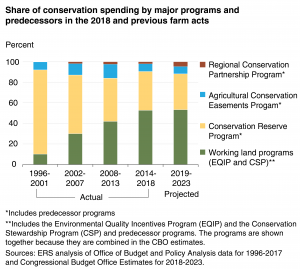 The acreage enrollment cap in the Conservation Stewardship Program (CSP) is replaced with a funding cap that implies lower spending in the future. Contracts signed under the acreage-limited CSP will continue; contracts that expire before December 31, 2019 can be renewed. Going forward, the 2018 Act sets spending limits of $700 million for FY2019, increasing to $1 billion by FY2023. CSP funding was $1.32 billion in FY2018 (estimated) and was projected to be roughly $1.75 billion per year, on average, for FY2019-FY2023 according to the CBO. Over the next several years, as spending for existing CSP contracts ramps down and spending on new contracts ramps up, CSP spending will eventually reach an overall lower level of spending commensurate with new limits. 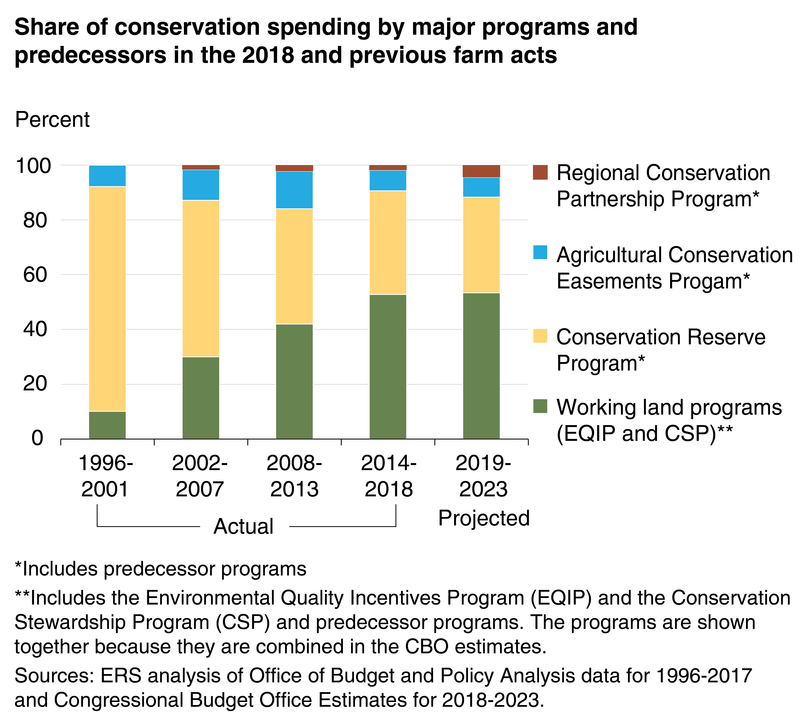 Changes in major conservation program funding under the 2018 Act will effectively halt the shift toward increasing the share of conservation funding for working land programs that began with the 2002 Act and continued under the 2008 and 2014 Acts. Last week, the U.S. Department of Agriculture's Economic Research Service (ERS) released a timely report regarding farm policy titled, "Federal Risk Management Tools for Agricultural Producers: An Overview." Today's post recaps highlights from the ERS report.